Global stock markets fell by almost 8% in October – a decline that even a few short months ago seemed unlikely. Investors were spooked in Halloween month by a combination of rising interest rates, increasing trade protectionism and political troubles in Europe. Not only has Italy put itself at odds with the European Commission by going ahead with plans of fiscal expansion beyond what it had agreed, but in Germany, Angela Merkel was forced to step down as head of her party after he coalition suffered a defeat in Bavarian elections. Plus, Brexit negotiations are going nowhere while the clock is ticking towards the withdrawal date of March 29, 2019. A survey of business leaders carried out by the Oxford Economics think tank shows that executives were gloomier at the beginning of the fourth quarter compared with the third. The number of those who think that risks to the global economy are weighted slightly to the downside increased by 1% to 57%, but more than 21% now believe risks are heavily skewed to the downside, versus just 6% in the first half of the year. Around 66% of those interviewed in the survey believe that the risk of global growth slowing sharply has increased in the past three months, whereas only 4% think that the probability of a sharp pick-up in growth has increased. More than 40% of respondents said they were worried about the risk of a trade war hitting global growth. The second-biggest risk, highlighted by almost 20% of them, up from just 3% three months ago, is financial turmoil on the back of faster-than-expected interest rate hikes by the US Federal Reserve. The survey was completed by 188 business contacts of Oxford Economics, which collectively employ around five million people and have a turnover around $2.5 trillion, between October 17 and November 2. Interestingly, very few respondents seem to worry about the risk of emerging market contagion, despite the Turkish lira and Argentinean peso crises back in August. This could signal increased confidence that developing countries’ fundamentals have improved compared with past crises. This tallies with some data on capital flows analysed by Bank of America Merrill Lynch, which show that investors have been tiptoeing back into emerging market equities, with $3.9 billion worth of inflows last week, the largest since February of this year. However, this does not seem to signal the beginning of another bull market just yet. 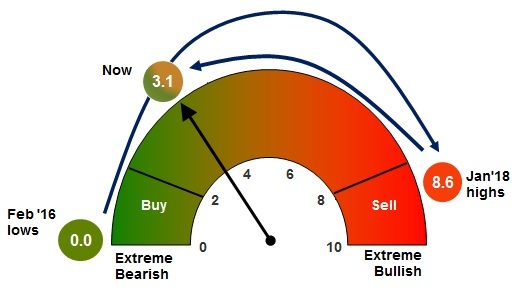 The Bull and Bear indicator, which has been quite accurate at predicting lows and highs in the markets, still has not triggered its Buy signal. It is stuck at the same level it was a couple of weeks ago. Of the indicator’s six components, one – equity market breadth – is very bearish, while three – equity flows, bond flows and long-only positioning – are bearish. Credit market technicals are bullish, while hedge fund positioning is very bullish. Does this mean a Green November will follow Red October? If we look at past patterns, this is a definitely a strong possibility. More than 60% of global stocks and 80% of those in emerging markets have already gone through a bear market. On the other hand, there is no rule for how low markets can go. Emerging markets seem to hold the key to the next rally, whenever that will be.